The Virginia General Assembly has completed its work with the special session to review amendments and vetoes from the Governor. These past four months have been marked by successes and defeats with regard to the death penalty. I will begin with the good news. VADP worked with the Virginia Catholic Conference, the ACLU of Virginia, and National Alliance on Mental Illness of Virginia – with support from the American Bar Association – on new legislation that would prohibits the execution of people with serious mental illness (HB 794). For much of the legislative session the patron — Republican Del. Jay Leftwich of Chesapeake — discussed the bill with members of the House Criminal Law Subcommittee. He identified subcommittee members on the fence about the bill and asked our coalition to organize grassroots support for the bill back in their home legislative districts. We fell one vote short of passing HB 794 out of the Criminal Law Subcommittee. We were, however, able to get a hearing on the bill before the full House Courts of Justice Committee. Ultimately, the bill was carried over to the 2017 legislative session on a voice vote. This was a very positive first year for this serious mental illness initiative. We were able to develop bipartisan support for the measure and learned a lot about opposing viewpoints that will help us next year. The bad news was legislation changing the execution method in Virginia. In March the legislature passed HB 815, a bill that would make the electric chair the default execution method in Virginia if lethal injection drugs are not available. Gov. Terry McAuliffe did not veto this bill. Instead he introduced an amendment to allow the Department of Corrections to obtain execution drugs in secret from compounding pharmacies. Unfortunately, the legislature approved Gov. McAuliffe’s ill-advised amendment. This new law will cloak the source of execution drugs in a veil of secrecy. The quality of compounded drugs varies significantly and presents a very real risk of horrific botched executions. The enactment of this secret execution drug policy was the result of a “perfect storm” of circumstances. First, an execution date was scheduled in March for notorious mass murderer Ricky Gray (which was subsequently stayed by the courts). The horrendous facts around the murder of the Harvey family were shamelessly exploited by death penalty supporters to browbeat their colleagues into voting for the original electric chair bill. Second, Gov. McAuliffe skillfully manipulated the legislative process to create a false choice for legislators: Either approve a policy that you rejected last year (secret execution drugs) or I veto the electric chair bill, and we have no way to execute the horrible people on death row. This false choice generated enormous pressure on conservative legislators to vote in favor of the Governor’s secret execution drug amendment. 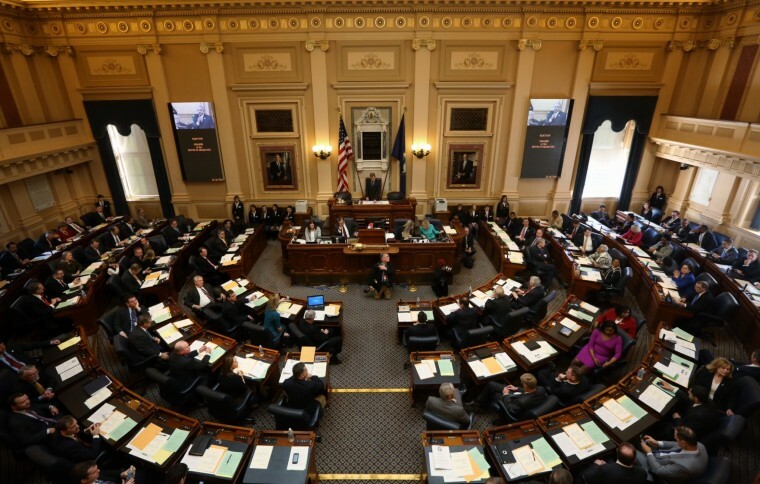 Third, despite all these factors, the House of Delegates STILL voted against the Governor’s proposal on its first vote, mustering only 47 votes in favor. But death penalty supporters would not accept defeat, and aggressively cajoled their colleagues. Unfortunately, twelve legislators succumbed to the pressure and changed their vote, approving the Governor’s execution secrecy amendment on a second ballot. Despite this setback, I am increasingly confident that, with your help, we can abolish the death penalty in Virginia by 2020. Our advocacy efforts have resulted in the emergence of a core of conservative legislators who have consistently voted against every death bill in the past two years. We have identified an even larger group of Delegates and Senators who struggle to vote in favor of these bills. They are torn by conscience, and only supported the electric chair or execution secrecy after intense pressure from colleagues and the Governor. Last year the Utah legislature passed a bill to make the firing squad that state’s default execution method if lethal injection drugs were not available. Despite that terrible vote, the same legislators nearly abolished the death penalty in Utah one year later. The state Senate voted for abolition, and the House was only a few votes short of supporting an end to capital punishment. Virtually all major newspapers in the Commonwealth opposed the electric chair bill, secret execution drugs, or both. Three newspapers — the Virginian Pilot, Daily Press, and Staunton News Leader — called for death penalty abolition. The death penalty is dying a slow death here in Virginia. No jury in the Commonwealth has issued a death sentence in nearly five years.